I don't think any of us knew exactly what we were getting ourselves into when this youth partnership began in 2010. I know we had high hopes and dreams to begin to "do youth mission differently," but we were not sure if it was going to "work." It's much easier to purchase group packages whereby mission is made easy and youth do not have to do much pre-trip preparation or make any post-trip commitments. But mission, ministry, and life lived as disciples of Jesus was never meant to be easy. Incarnations of God's dreams for the world was and is never meant to be short-term. There is no need to wait until youth are adults to implement genuine and long-term partnerships. As I sit here on our flight home from Tegus to Atlanta, then onward to Philadelphia, I am overwhelmed by what God has birthed out of our initial adventures of prayer and discernment years ago. Together, with our youthful sisters and brothers in Honduras and those of Imago Dei Youth Ministry, we have created something special. We are learning together, dreaming together, praying together, empowering together, and collaborating together how we can now pursue mission together. Last night was yet another affirmation that what we are up to together is indeed good and beautiful. My traveling companion and I gathered together, alongside our PCUSA mission-co-worker, in the the upper room of Peña de Horeb. They had their computer and projector set up, pizza, soda, and ice cream on the table, and a video of our partnership through the years titled, "Nuestra Historia," paralleling the theme from our weekend together. We laughed. We smiled. I certainly cried. And as we broke bread together, I could not help but think of yet another gathering in an upper room when bread was broken and stories were shared about in-breakings of God's dreams and realizations of God's kingdom happening right before their eyes. Shared hopes. Shared dreams. Shared mission. They didn't know what was ahead. We don't necessarily either. What we do know is this is exactly what we are called to be doing right here, right now, and in the days ahead, too. We also know it is time to move towards colaborative action. While we wrapped up conversations in that Honduran upper room along the highway, we recognized once again that now is the time for collaborative action. This was the year for shared mission. This summer we will create opportunities to serve even as we continue to learn together. Tire gardens and sustainable food efforts? Repairing homes of youth in the community? We are not sure what this will look like over the summer or thereafter. What we do know is the mission will be shared and efforts will be collaborative. 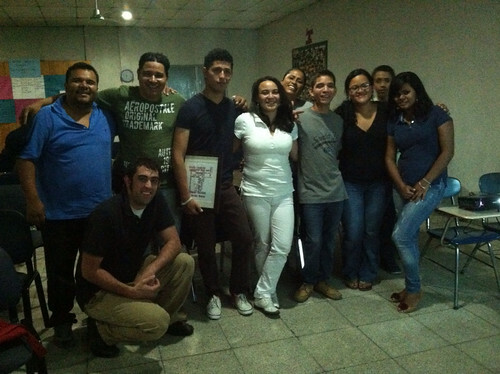 They will be initiated by youth in Honduras and actualized and sustained together through cross-cultural partnership. Then we will know this friendship has truly matured, even as the growth continues into something far more beautiful than any of us ever dreamed possible. "This type of partnership requires hard work, sustained vision, strong commitment, and relentless perseverance in the midst of huge relational and ministry challenges...they also readily testify to the gratifying fruit it produces" (Linking Arms, Linking Lives, p. 111). 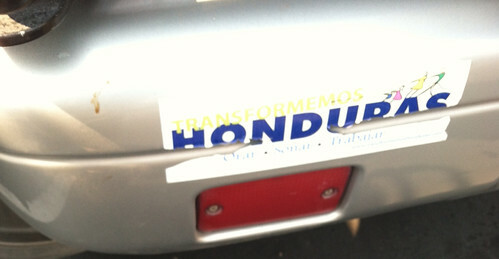 "Tranformemos Honduras" is the education reform initiative through AJS. The tag line of "Orar. Señar. Trabajar." Translates to "Pray. Dream. Work." Fits quite well with our vision for partnership, eh? Top Photo: Celebrating together in the upper room of Peña de Horeb. Love this group of youth leadership! *The subtitle of this book is, "How Urban-Suburban Partnerships Can Transform Communities." While the collection of authors (Ron Sider, John Perkins, Wayne Ordon, and Albert Tizon) intended this as a domestic resource, the implications are beneficial for international partnerships just as well.